For homebuyers, deciding what you want “ and need “ in a home is crucial. Savvy buyers take time to research and gather information in order to make the most informed decision possible. For those interested in buying a waterfront home, knowing the ins and outs of this specialty market is absolutely essential. Whether drawn to the ocean shore or the river’s bank, the primer below will guide interested homebuyers on how to purchase that little slice of paradise by the water’s edge. What is your waterfront lifestyle? As with any home, understanding your needs will help you better evaluate eligible properties. If you are considering the purchase of a waterfront property as a vacation or second home, you may want to get a feel for how active the vacation rental market is for the periods that you will not be using the home. However, if you are looking to find a waterfront home to serve as your primary residence, you will be less concerned about the local vacation rental market and likely more concerned with access to important services in the area. Likewise, you’ll want to consider the types of activities you enjoy. This is of particular importance if you’re considering the home as a vacation getaway. Whether summer home or full-time abode, you want to make sure the property you choose makes it easy for you to enjoy your favorite pastimes. Swimming – The thought of being able to step out one’s back door for a casual swim is enough to entice many to a home on the shore. If swimming is high on your list, you’ll want to evaluate potential properties both for the quality of swimming as well as ease of access and safety. For riverfront properties, how fast is the current during hot summer months? For coastlines, are there any rip tides or outbound currents that could present danger? Is the potential swimming area near boating lanes or docks? How easily can the shore be accessed (for instance, is the best potential swimming area down a steep trail or long set of stairs)? Remember to evaluate safety concerns not only in terms of you and your family, but your potential houseguests that may include young children. Boating – For avid boaters, the size of the boat becomes a crucial part of finding a waterfront property. Many waterfront properties are not suitable for a larger boat due to river depth, oyster beds or tides. Even if the overall body of water is deep enough for bigger vessels, there may not be adequate access all the way up to your property. You will also want to consider the type of boating activities you like the most. Many smaller lakes do not allow waterskiing or jet skiing. Fishing – Fishermen will want to stick to properties with easy access to the water. Talk to homeowners and residents throughout the area to get a feel for the quality of local fishing. From there, it largely depends on the type of fishing you like most. 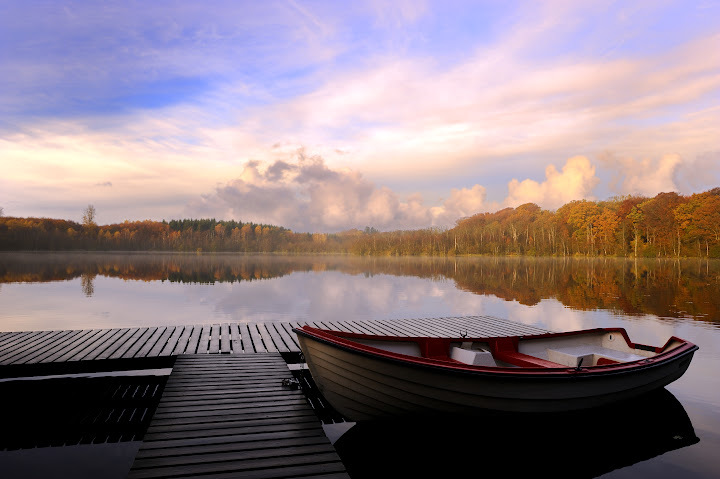 Kayaking or canoeing – While large, active bodies of water are a good fit for many boaters, some buyers may be looking for a more intimate waterfront experience. Rivers and smaller lakes are especially good fits for kayakers or canoe enthusiasts, especially those who prefer to enjoy the quiet of nature rather than compete with jet skis and power boats. Carefully evaluate the property - Some homeowners will fall in love with a waterfront home without paying much heed to the property it sits on. An idyllic waterfront home may turn out to be a disappointment if you later realize that views are obscured from inside, there is poor access to the water, or you’re 30 feet from a noisy public boat launch. Don’t lose sight of the home itself – By the same token, it can be tempting to fall in love with a perfect patch of property that houses a less than perfect structure. Unless you have the appetite for a major remodel or teardown and rebuild project in the future, you’ll want to openly and honestly review each home independent of the surrounding property. Does the house meet the basic criteria you defined at the outset of your search? Does the home compliment the property? Is it someplace you could see yourself happily living? Look into loans early – Many waterfront properties are more expensive than other properties and home loans can often fall into the jumbo mortgage category. Lenders will therefore only consider very qualified buyers. Begin the process of mortgage shopping sooner rather than later. Weather the weather – In general, waterfront homes receive more abuse from the elements than the average home. Extra measures should be taken to protect homes near water, especially those along open coasts. Depending on the area, the home may need storm shutters, corrosion-resistant stainless-steel locks, and special landscaping measures. What is the insurance like? Savvy buyers will investigate home insurance in the area in order to understand what they’re getting into. Waterfront homeowners may be required to buy additional policies such as wind policies, flood policies and general hazard policies. In addition, obtaining standard homeowner’s insurance may be more complicated and costly due to the liabilities and hazards of living on or near a body of water. Find out what you can do with the property – If you are contemplating the idea of any changes to the waterfront property, such as adding a dock or a seawall, investigate the process before buying to ensure that these updates will be possible. Government agencies often have strict and unyielding land use regulations, and you don’t want to commit to the considerable commitment of a home purchase without knowing that you can safely do what you want to make it your own. As mentioned above, you should check with local regulatory agencies to find out what kind of activities are allowed on the body of water, as some areas have restrictions on jet skis, speedboats and other watercraft. Talk to neighbors and local residents – Ask neighbors and other locals whether or not they enjoy living in the community. Find out if there are any problems associated with owning waterfront property in the area. If at all possible, ask if there are any issues with the individual property or properties you are considering. Check on the utilities – In many cases, waterfront properties are not necessarily on the beaten path. Buyers accustomed to the city or suburbs may assume that electricity, city water, septic system, cable and high-speed Internet will be readily available at their new waterfront home, but things may not be so simple. Many waterfront homes operate on well systems, and homes near bodies of water often have delicate plumbing. In addition, many rural waterfront areas are not wired for high speed internet or broadband cable. Adding some of these services may be expensive, or simply not possible. How’s the view from there? More than anything else, the kind of view a waterfront home affords is the one attribute that can be universally enjoyed. A home with a picturesque view allows you to enjoy your waterfront setting regardless of whether or not you engage in activities in, on, and around the water. When looking at potential properties, consider how well the home takes advantage of available views. Are windows large and well placed? Are common gathering rooms situated around viewpoints, or are the best angles relegated to kitchen window peek-a-boos? Do outdoor patios, porches, or decks provide an open air view venue?How level is the property? Often overlooked, the terrain of the home’s property is actually quite important. Flatter lots allow easier access to the water for people of all ages, and allow for a wider range of outdoor activities. Privacy concerns – The amount of water frontage the property has will influence just how much privacy you and your family are afforded. Properties with 50 feet of frontage or less will offer very little privacy. At 100 feet of frontage, you will have more privacy, while 150-200 feet gives you a strong degree of privacy. In general, however, if you have a great water view it can work both ways – those on the water can also see you as well. Bargains – Buying a waterfront home can be a pricey prospect. Here are a few simple strategies to save without heading for the hills. Buy a street or two away from the water – Second-row beach and lake homes drop dramatically in price, yet usually are only a short trip away from the water. Homes farther from waterfront are also less affected by storm weather. Go condo – Condos are traditionally good buys because developers can put more of them on a smaller amount of property, giving their investment a bigger payoff and passing some of the savings along to the buyers. Don’t forget to consider maintenance and homeowners association fees when you calculate your payments. Consider a duplex – Duplexes are particularly popular at the beach and are a great way to land a freestanding home at a lower price.